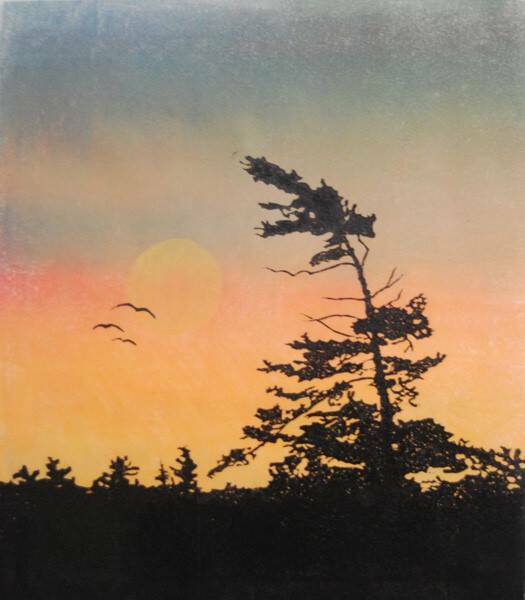 Angela Hennessey is a local printmaker who we’re excited to work with to present a printmaking workshop this fall inspired by Luminous John Lander. We thought we’d learn a little more about Angela, her practice, and the value of instructing. I’m a process and procedure person – printmaking is all about the process, the end result is almost unimportant. The scope of the many different techniques that can be employed is endless. I’ve been printmaking exclusively for the past 9 years and still haven’t tried all the permutations and combinations that are possible! Because I bore easily, I really need variety in my work – printmaking allows that “in spades”! What’s your favourite thing about teaching art? Getting the student to be as excited about the process as I….. seeing their delight at the results of their efforts! If you mean – in all the world – Tom Thomson’s “The West Wind” – it evokes my childhood, my parents admired him greatly and that was passed on to me. My family would go camping in Algonquin Park every summer, a wonderful experience for me. What can participants look forward to in your upcoming class? Participants will learn the pleasures of cutting the soft lino – it’s quite “buttery” – and then will print a small edition of their unique image. Best of all, they will have the printing plate to take home, where they can continue to make prints, as this method doesn’t require a press! Click here to learn more about Angela’s upcoming workshop.